This is my character from Skyrim. I never played skyrim, i don't like it because it's dark (no lights) and depressing! Greetings from the US! Danke! It was my favorite mask! That's cool, it's my favorite mask too! 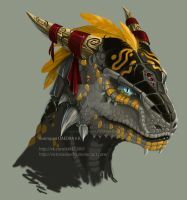 This looks almost like my Argonian character!!! This is incredible! 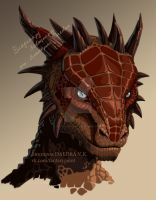 This makes me want to draw my OWN Dragonborn, who also happens to be Argonian! Might I ask what armor he's wearing? It almost looks like Dragonplate armor, but I can't quite tell with the B/W Style. Oh, and the sword, too! What sword is that? Same as before, it looks like a Dragonbone Sword, but I can't quite tell. This is amazing! The pose makes him look so badass! This is one of the most badass images I've ever seen, plus the Argonians are my favorite race. Great job man, you definitely earned a favorite. he's badass! that armour looks awesome as well, what type is it? If you do, post a pic! I'd love to see it! 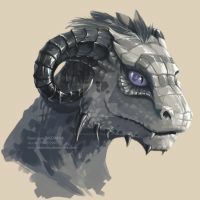 That is the coolest looking Argonian art i've ever seen! Love the look of this guy. Sure thing! Coolest Argonian I've seen. by the way i'm actualy drawing my own character, maybe i'll post it this weekend, if u wana checkout i'll be glad. Awesome! Let me know when you have it up. Maybe in the next Elder Scrolls game! omg, this is absolutely stunning!! !